Thread: How much change is too much? 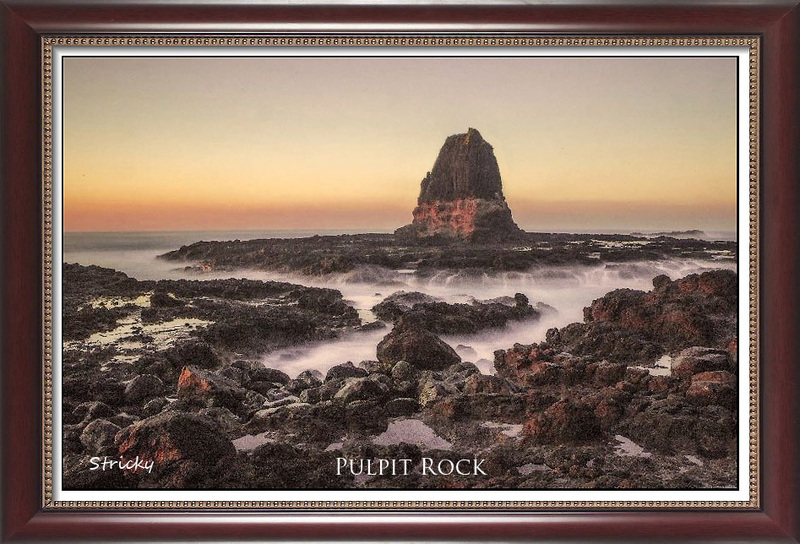 While I like the image I took at Pulpit Rock near Cape Schanck in Victoria, the sky was very disappointing that morning. While I could add an entirely different sunrise to make it look more dramatic I sometimes still feel like it is cheating and I should only enhance what nature provided that day and not totally change it. Does anyone else feel this way or is it just me? Re: How much change is too much? Got to agree although I may have fiddled with a few in the past. What I don't find acceptable is to create sunsets and rainbows pretending that they are natural. It takes away the special nature of the real thing. I like your subject in this shot but I do think you should straighten the horizon as I'm pretty sure the sea wasn't tilted on that day. The sky is fine and you could probably saturate that a bit if you wanted to lift the shot and brighten it somewhat. Nice - agree that the horizon is a bit skewed - there will always be another sunrise to capture! Feel free to have a go. I am only average at editing, but practice makes perfect they say. Here's my little enhancement.. nothing added that wasn't there! Apart from the text and frame that is! always give black and white a try when you have a really photo (sorry) that really means more to you than a photo . Not sure I like that sky (??) . Thanks Closei & Ian, makes me realise I need to improve my editing skills. I really like the changes and appreciate your help. Good editing starts as the subject passes through the first glass on the lens --- as the saying goes in out so therefore; too many rely too much on editing tricks just to make the image "acceptable"
You don't really want to know how much time I spent to get the file to the final result; a result that has surprised me. As mentioned above; slow dodge and burn is still one of the better editing tools after the basics . Unless you documenting a place or thing for a museum or the like, why is there even a question about too much? It's your image and you should be free to make of it whatever you want it to be. Even the great Frank Hurley 'augmented reality' as an official war photographer. As long as you aren't claiming it to be a faithful reproduction of reality, then it it is up to the artist to portray their vision, in whatever form that takes. those who think every photo should be "as it was" are missing a great deal in modern photography . That's not to say every film recorded photo is a prefect "as it was" photo. Just to throw in my 2 penny-worth. I try to limit the augmentation to the things I could do in the darkroom (yes, I'm really that old). Get rid of colour casts or saturate the colours by dialling in the colours on the enlarger head and adjusting exposure times, dodge and burn using masks, use different grades of paper to get harsher or softer looks. I often feel the ''only experienced digital' photographers have missed a lot by not experiencing film photography and darkroom editing. There is no doubt the old film and darkroom ways were great teachers . A big mistake many make (me too at times); is to be in a rush to share our masterpiece online or worse still, get a big photo printed . It makes very little difference; if any when cyberspace sees our photo so generally there is no point rushing to share . And good way to back off is put the original file or basically edited original file above the edited version (talking layers) and use the opacity slider to reduce the edit effects . I now make a habit; via an action/macro/preset to put a duplicate original Lr5 edited photo at the top of the layer stack so I can flick the layer on and off as I go. I also have a number of photos ''on the go'' at the same time so to give the eyes and mind "a break"
remember; more people buy saturated high gloss landscape photos than "as it was" photos -- that was big mistake of mine!